Learn from eScholar subject matter experts and your colleagues in other states on how your state can get the most out of the eScholar Uniq-ID solution. Request an invitation below! Since the first implementation in 2004, eScholar Uniq-ID has redefined how state agencies can match and assign unique identifiers. Join us at the 2018 eScholar Uniq-ID Conference to enhance your skills around eScholar Uniq-ID, hear firsthand about the product’s vision and roadmap for the solution, and build relationships with your peers from other state agencies. This conference will also be a great opportunity to share your experiences with Uniq-ID and provide ideas on other ways the application can be applied. With deployments in 10 states and the US Department of Education, this is a unique opportunity to bring together a national community on one of the key elements for any state data system. Together, we will continue to innovate as partners in progress. Build your skills and knowledge on Uniq-ID applications. Learn from Uniq-ID subject matter experts about features and capabilities you have yet to use. 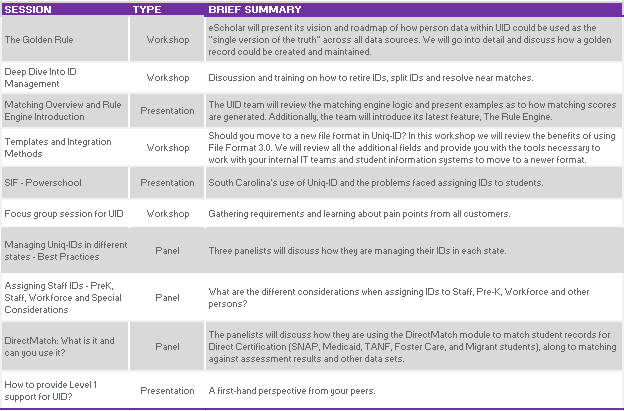 Presentations will also be given by users on how they have integrated Uniq-ID in their practices across the state, from their SLDS to their direct certification process. Share your best practices. Do you have a Uniq-ID project you want to share with your peers? Have you applied a capability in eScholar Uniq-ID in a different way? If so, submit a session proposal for the conference. Network with colleagues from around the country. Though the Uniq-ID community is a national community composed of 10 states, it isn’t often that we get an opportunity to come together as a group. With this conference, you can meet your peers from other states and learn about their projects and best practices. Be an active partner in the product’s roadmap. Several eScholar leaders will be in attendance, including eScholar Product Manager Juan Guerrero, who will share the product’s mission, vision and roadmap. As part of this conference, we would like to work with our partners to ensure we continue to innovate and optimize your deployment of Uniq-ID. It’s Free! As part of your free registration, eScholar will be providing meals, local transportation, and lodging. This is our way of showing our gratitude for being a Uniq-ID partner.